I was very excited to take my first ever fashion design class as my major at school is more business geared and less creative design. I chose to take the Leather Technology class at FUA and it was by far one of the best decisions I have made. I was scared at first knowing I did not have much experience, but I immediately felt welcomed by my professor and she gave our class tons of creative experience to create pieces that we truly loved. 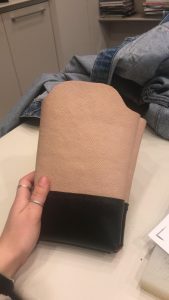 Our first project was a crossbody bag that we got to keep for ourselves. Everything else we create is sold in the non-profit school store “FLY” which gives its proceeds to scholarships for students that attend FUA. 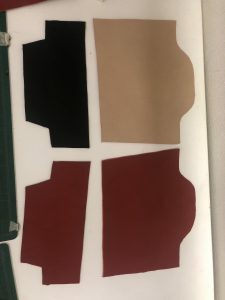 Throughout the semester we also create a belt and a garment to be sold in the store. We even get to work with the straw hat and bag class to create pieces to go together and create a story for the customer. 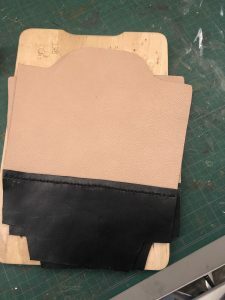 I quickly learned many leather techniques and began constructing my bag. I chose a main color of tan with a black base and a red leather interior for a surprise pop of color. 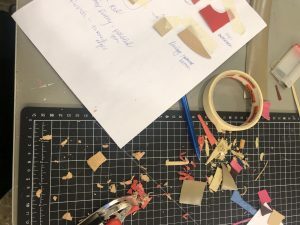 As I learned and observed my professor, she walked us through cutting our pieces out, attached them together and how to begin the hand stitching process. 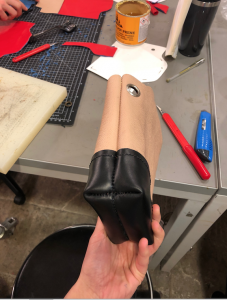 A few hours of work were required out of the classroom that I genuinely enjoyed, and I looked forward to heading to the leather lab during my free time to work on my piece. I believe that this is what makes this piece so special to me. To me, my bag represents the hard work and time that I put into this piece. Each time I now wear it I have a big smile on my face knowing that even though I first doubted myself, I listened, learned, and ultimately made a beautiful piece of work. Bag with grommets ready for the strap!